Carbonate petrography is the study of limestones, dolomites and associated deposits under optical or electron microscopes greatly enhances field studies or core observations and can provide a frame of reference for geochemical studies. Petrography is an especially powerful tool because it enables the identification of constituent grains, the detailed classification of sediments and rocks, the interpretation of environments of deposition, and the determination of the often complex history of post-depositional alteration (diagenesis). The last of these, the ability to determine the timing of diagenetic events such as cementation or secondary porosity development relative to the emplacement of hydrocarbons or metallic ores, makes petrography an important component of geochemical and sedimentologic studies in energy and mineral resource exploration applications as well as in academic research. The petrographic study of carbonate rocks is particularly useful because carbonate grains, unlike clastic terrigenous ones, normally are produced in close proximity (from less than a meter to hundreds of meters) to the site of their ultimate deposition. In addition, carbonate grains are formed mainly by organisms, and thus the grains convey ecological information about the environment of formation as well as stratigraphical information on the age of the deposit. In some ways, carbonate petrography is not a very complex undertaking, especially when compared to the petrography of clastic terrigenous deposits. Most carbonate rocks are dominated by just one or two common carbonate minerals (mainly calcite and dolomite) plus a limited number of accompanying minerals silica, detrital grains, phosphate, glauconite, and a few evaporite precipitates. 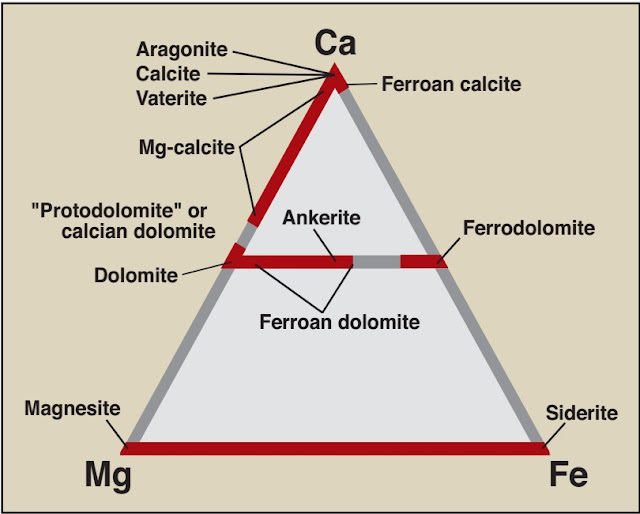 The diagram below shows the general compositions of the full spectrum of carbonate minerals found in modern and ancient strata. 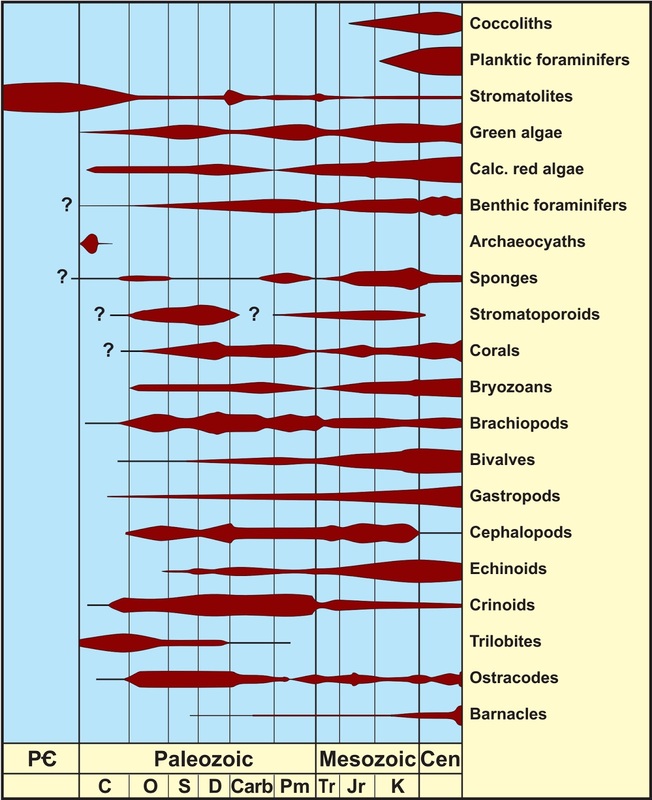 A diagram summarizing the fluctuations in approximate diversity and abundance of the major groups of marine carbonate-producing organisms through time. In other ways, however, carbonate petrography can be quite complicated. Many different organisms produce carbonate material and that requires learning how to recognize a wide variety of shell morphologies and wall structures. The changing assemblages of organisms through time (figure above), coupled with the randomness of thin section cuts through complex shell forms, add to the difficulty of identifying skeletal grains. Furthermore, because many primary carbonate grains are composed of unstable minerals (especially aragonite and high-Mg calcite), diagenetic alteration commonly is quite extensive in carbonate rocks. The variability of inorganic and biogenic carbonate mineralogy through time, however, complicates prediction of patterns of diagenetic alteration. Carbonate petrography is primarily a qualitative skill. One must learn to recognize the distinguishing characteristics of skeletal grains of various ages, cut in various orientations, and preserved in various stages of alteration. There are no simple diagnostic tests (such as measuring birefringence or an optic figure) that can be used to identify a bryozoan, for example. It is simply a question of experience. Comparison of grains in thin sections with photographs of identified grains, allows geologists to readily identify the majority of the rock-forming grains in their samples. Most pictures were chosen to illustrate typical rather than spectacular, but unusual, examples of grains and fabrics. For example, grains that were originally composed of aragonite normally undergo wholesale diagenetic alteration and extensive destruction of primary structural features. Therefore, we show examples of these grains in their extensively altered state because that is the norm for what the user will encounter. Examples also were specifically chosen from a variety of countries, basins, and units to provide a sense of the global consistency of carbonate fabrics. Furthermore, examples will be included in further posts from rocks of Precambrian to Holocene age because of the enormous evolution art changes in organisms (and, therefore, carbonate deposits and their alteration) through time. Visual comparison charts for estimating abundances of constituents in thin section, peels, and photographic or digital images. 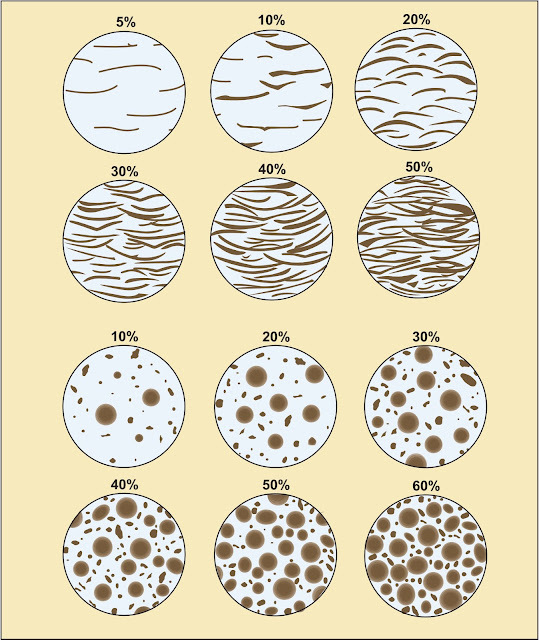 Research conducted over the past several decades has outlined many principles of deposition and diagenesis in carbonate sediments. Facies models have been established for modern (as well as ancient) reefs and other bank-margin deposits, for tidal-flat and sabkha sedimentation, for basinal deposition, and for other environments. Diagenetic studies have pointed out the influence of syndepositional marine cementation, early freshwater diagenesis, and later subsurface compaction-dissolution phenomena. This work has clearly shown that, although carbonate depositional and diagenetic patterns may be complex, commonly there is a large volume of information recorded in the rocks, which can be used to decipher this record. Petrography, when used in close conjunction with well-log analysis, seismic interpretation, regional geology, and other studies, can be an invaluable tool for applying these recently developed principles of carbonate sedimentology to ancient rocks. Furthermore, it is best applied by the explorationist who is deeply involved in techniques other than petrography, for that person is in the best position to ask the right questions, questions that petrography may be able to answer.